In 1979, when the motorcycle sales reached a very low point, it was questionable if BMW should continue the production of motorcycles at all. Initiated by Dr. Sarfert, the former management´s chairman, they decided to do so. But, after all, they knew that only with their current range of models, they wouldn´t be successful in the future. 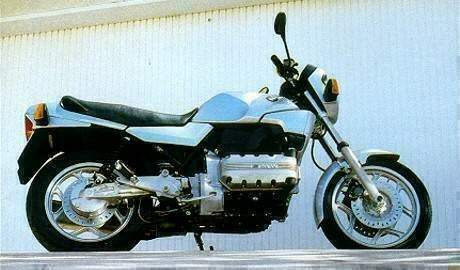 So, within the next four years, the planned BMW´s most innovative motorcycle ever: the K589 project. Two years earlier, in 1977, the BMW engineer Josef Fritzenwenger built a curious experimental bike: As a trial, he mounted the engine of a Peugeot 104 car longitudinally into a motorcycle frame. This engine was chosen because it was mounted in the car almost horizontal, too. The water-cooled, inline four-cylinder was flanged provisional to a BMW boxer gearbox. Unfortunately, there´s no picture available of this experimental bike. 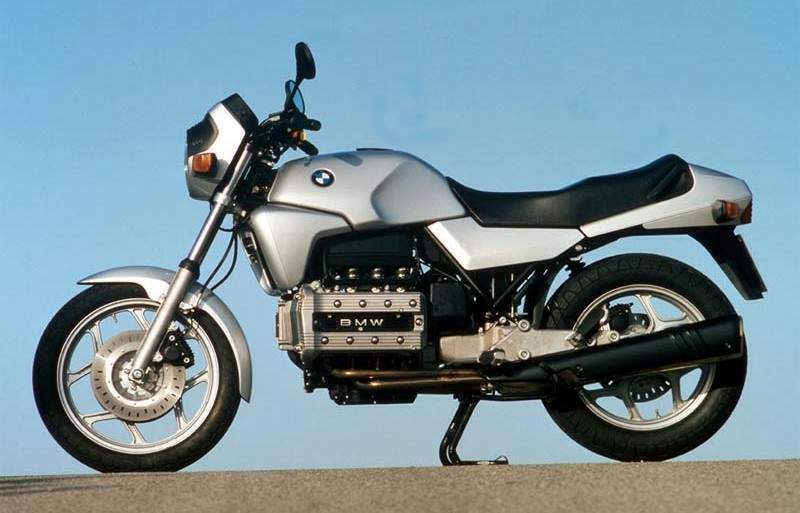 The motorcycle was destroyed later on, and BMW developed an own engine, called “K4”. But the handicap to build a big engine with a cubic capacity of up to 1300 cc (which could be used for cars as well) leads to the wrong direction: the big bores would have caused a crankcase that is too long for a longitudinally disposed engine. At the same time the engineers developed a triple, called “K3” with 1000 cc. Both experimentals were equipped with only one overhead camshaft and lever driven valves (like the BMW car engines of the seventies). Regarding the higher rotational speed of motorcycles this would probably have caused problems after a short time. Remember the short service intervals for the valve clearance of the boxer engines ! These engines were disposed with the cylinder head to the right, this caused additional problems as exhaust and shaftdrive had to be located on the same side of the bike. In 1979, BMW finally decided to realize the project but to change the handicaps. A cubic capacity of up to 1000cc, 90 PS / 66 kW, good and even torque. This concept was presented to the Munic patent authority on February 1st, 1979 as “BMW compact drive system” and was finally patented in 1981 (registered as DE 29 03 742). Although, the British “Ariel” company had tested an quite similar concept in the early sixties: a longitudinally-disposed 700 cc in-line four, air cooled, with shaft drive on the right and exhaust on the left...well, after all Ariel decided not to continue the experiment due to serious problems - contrary to BMW, where a four years lasting development process has been started after the management had agreed. The longitudinally disposed four-cylinder combines the advantage of an in-line engine with some benefits of a boxer engine. Its centre of gravity is low, it could drive a shaftdrive, which is indispensable for BMW, directly and is due to its good accessibility easy to maintenance. In addition, it is easier to get more performance out of a four-cylinder. Its production is relative inexpensive, it is easy to meet exhaust regulations, noise restrictions are no problem and it is solid enough to reinforce the frame. The motorcycle demonstrates a State-of-the-art-bike a large number of mentionable details beside the engine. The fuel-air-mixture is produced by a Bosch LE-Jetronic. Electronic devices are the main attraction, ignition and fuel injection are working together as a team. Plus, the electronic devices are monitoring important functions such as the brake lights. The wiring uses twice as much cables as the boxer models. Typically for BMW is the powerful battery with 20 or, on request, 30 Ah. Therefore, devices like heat grips, power socket or four-way flasher may be combined without problems. Power connectors, relays and fuses are well protected against moisture and dirt, as well as the electronic components. The ignition is absolutely maintenance-free. The exhaust system, a part which is disputed due to its design, is made of rust-free special steel, the fuel tank of aluminium. Main and side stand are mounted to a pillow block bearing underneath the gearbox -there is no frame bearing which could be prone to wear out ! The rear swing arm receives the shaft drive and the rear brake. As a result, the real wheel could be removed within a few minutes by loosening of four screws. Swing arm, gear box and engine may be, but doesn´t have to, removed as one part. I don´t know any other bike which is as easy to maintenance. 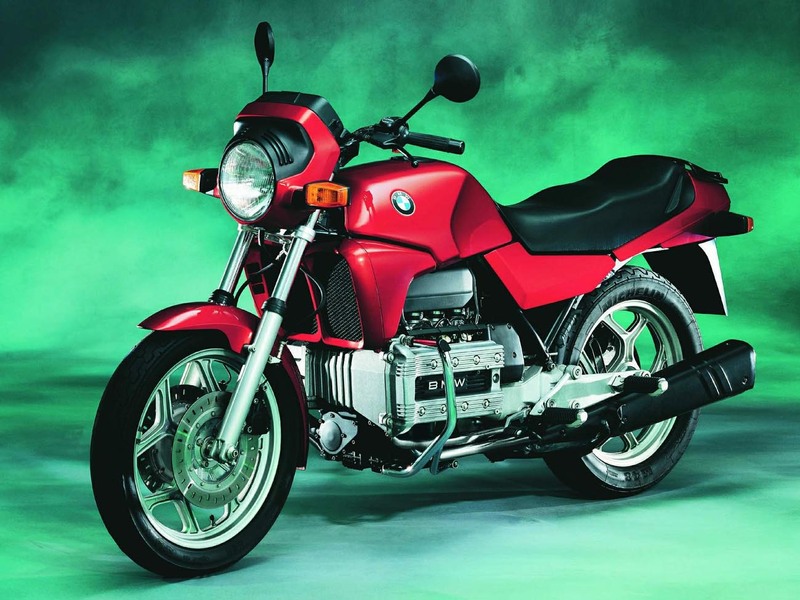 The K100 was designed by a team which was leaded by Karl Heinz Abe, Klaus-Volker Gevert and Claus Luthe. Karl-Heinz Abe was responsible especially for the K100 design which grew over a period of four years. Prior mass production, test rides with more than 650,000 km have been made with pre-production bikes. More than 100 employees of the research & development department have been in charge with the project. Not only regarding the new K100, BMW decided to build Europe´s most modern motorcycle factory at an expense of 300,000,000 DM. It has been created from the “BRAMO” building which was built in Berlin-Spandau in 1928. Starting in 1983 with the first K100, this is the factory where all of the K- and boxer bikes have been built on the same machine line. In case of the K bikes, the “compact drive” (engine, gearbox and swing arm) was assembled first. The frame was lowered to the unit later on. By the way, the K100 can be disassembled in the same manner if neccesary: engine, gearbox, swing arm and rear wheel are left as one unit, frame, front fork and -wheel are moved forward. Every K100 was tested up to 140 km/h on a test stand prior shipping. Three different design versions have been built within the first years: K100, K100 RS and K100 RT. This is similar to the boxer tradition. 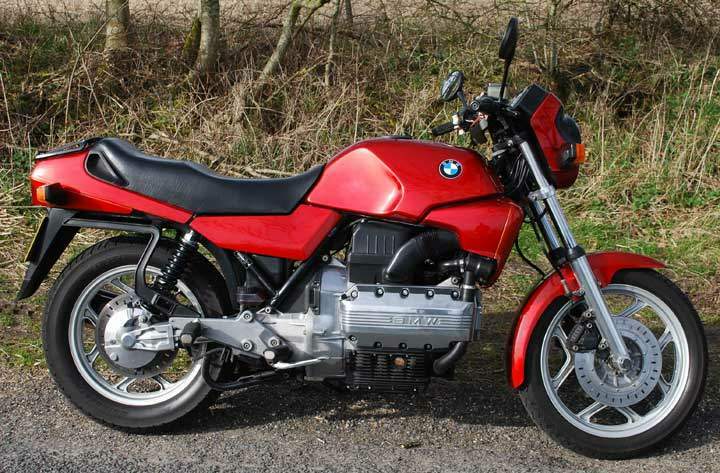 1986 the K100 LT luxury tourer was added to the queue. It replaced the RT in 1989 and was equipped with radio kit, comfort seat and topcase additional to the RT standard. Beside the basic K100 (which would be as a “naked bike” more successful today! ), the “RS” was particularly praised and bought. This was a merit of the fairing, which was both useful and pretty. Pretty, because some people didn´t like the design of the naked K100. Useful, because it was streamline in its design. This results in good weather protection, even the rider´s hands are well covered by the mirrors. A small spoiler on the windscreen is deflecting the wind at high speed quite effective. It is amazing to see the RS running 221 km/h with “only” 66 kW. Even if the rider is sitting upright the RS still reaches 215 km/h due to its cW x F value of only 0,429 (when rider is sitting upright). The hard boxes are wind optimized, too, so that hard boxes even increase the top speed without a negative effect to the tracking. It was calculated that a K100 basic would need 83 kW to reach the top speed of a “RS” or, the other way: at 200 km/h a “RS” consumes three litres fuel and needs 20 PS less than a basic K100 ! The only technical difference is a “longer” rear wheel ratio which is standard at the “RS” and was available on request for the other bikes. The fuel consumption is only 5.7 liters per 100 km. Let´s take a test ride ! Gentleman, start your engines: It doesn´t matter if the engine is cold or hot, after a few rotations of the starter the engine is running. The “choke” lever doesn´t make the mixture richer, it only increases the rotational speed - of course the fuel injection controls the mixture. Under any circumstances the engine is running at 1000 rpm if the “choke” is into “off” position. The first gear engages without any noise (why do other manufacturer still use an oil clutch?). The gear lever has quite long distances, but shifts well. After a short time you´ll reach the fifth gear, which may be used from 35 km/h on, that means 1300 rpm. 3000 rpm result in 80 km/h. Unfortunately, some rpms later the engine will start to vibrate, most noticeable between 90 and 120 km/h. Rider who are about a vibration-free bike won´t be happy with a K100 (but with a K75!). At lower speeds the tires (in my case: Metzeler ME33/99) will react with a swerve when crossing road markings. On the other hand, the RS is a very stable bike at high speeds, which is a great advantage of the RS fairing. Long distances are easy to pass. If the rider cowers, the fairing covers him perfectly, if he´s sitting upright, the wind will reach him, but not as a hurricane. The RS fairing is ideal for fairing haters as me: depending on my mood and the weather the wind may be “regulated”. The water cooling deflects the waste heat in direction of the mirrors and the handlebar, which is an advantage or an disadvantage, depending on the weather. BMW is well known for offering accessories that are perfectly integrated. For example, hard boxes with carriers may be mounted without moving flashers, no “one size fits all universal mounting kit” has to be used and the boxes doesn´t stick out. I was very pleased to know that a “four way flasher kit” is still available after 18 years. The cable connectors are already installed at every “K”, only the switch has to be connected. But, after all, the best argument for this bike is its reliability. The K100 was the first bike which lasts a 100,000 km road test at the “mo” and “MOTORRAD” magazine -with only few repairs. Just as little as in case of Winfried Adam´s bike, which was presented in the “MOTORRAD” magazine, issue 12/1998. At this time, his K100 basic had last more than 409,000 km! It is quite usual that the engine is running some hundred thousand kilometers, only the clutch, the cam chain tensioner and the gear drive between crankshaft and clutch are prone to fail after “only” 80-100,000 km.